With Spark’s a unified framework for big data analytics, perform tasks that would have previously required separate processing engines. We offer instructor-led training for both Private Corporate & Public Classes for hands-on experience with the latest version of open source Apache Spark. 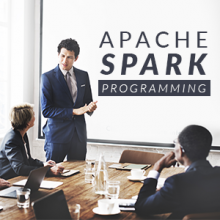 deliver the most up-to-date curriculum in Apache Spark™. when you take 105/301 courses. Spark is a unified framework for big data analytics. Spark provides one integrated API for use by developers, data scientists, and analysts to perform diverse tasks that would have previously required separate processing engines such as batch analytics, stream processing and statistical modelling. Spark supports a wide range of popular languages including Python, R, Scala, SQL, and Java. Spark can read from diverse data sources and scale to thousands of nodes. Adelantus is a proud Authorized Training Partner for Databricks offering Instructor-led training for both Private Corporate & Public Classes for hands-on experience with the latest version of open source Apache Spark in the cloud-based Databricks platform. Our certified Trainers are experienced Big Data professionals able to deliver the most up-to-date curriculum in Apache Spark™ in the US and Latin America. We can help you acquire new skills in Apache Spark, understand these new, big data, cutting-edge technologies that can provide new business opportunities. We are offering public and private training courses for developers, administrators, data analysts, data scientists, IT professionals and business executives.